As some of you may know, back in September I lost my beloved Ollie. He had been with us since he was a kitten and was seventeen years old when he passed away. His loss hit our whole family very hard, he was such a big part of our lives and even now, three months later, I cannot believe that he is gone. He was for most part quite feral in nature, back when he was younger he never really wanted fuss and used to loathe being handled. What he did love was being outside, rolling around in the sun and lounging asleep under his favourite hedge. As he got older he did change quite a bit, he loved to have a good fuss and always came to greet you in the morning with the most adorable little meow. He had the loudest purr and the most beautiful features. He was our boy through and through and I will never ever forget the joy and love that he brought to our home. It goes without saying that he meant so much to us, therefore losing him brought an overwhelming feeling of absence. I knew that for me personally I could not be without a cat for long, I am a huge animal lover and there were, and still are so many cats out there that need new homes. No cat would ever replace Ollie, he was one in a million. Yet at the same time, I knew I could easily fall in love with another. Therefore, I set about looking into re-homing a new cat. I knew that I wanted an older cat, I love kittens of course and would have really enjoyed having one again, however the timing was not right to take on that level of commitment. An older cat was what I was looking for, a cat that ideally would prefer to be indoors as we do live by an extremely busy road. This latter part was quite tricky, most cats want to be able to have the freedom to go outside, unless of course there is a valid reason why they cannot. I couldn’t take on a cat that wanted to be outside, I couldn’t bear to lose a cat to the road as it would not be fair, however I also wouldn’t want to deprive a cat of having that freedom as I knew how much Oliver had loved the outdoors. Due to this, I found it quite difficult to find a suitable cat for our needs. Then one day, whilst on Facebook I stumbled across Lou. She was on a re-homing page for one of my local, independent cat rescue centres. She needed a new home as her owner at the time could no longer look after her. I immediately made enquiries, there was something about her that caught my eye, and, more importantly she was an indoor cat. Luckily for me, the owner agreed to make a visit in order to run a few checks, to view our home to ensure that we were suitable for her and of course to make sure we were not weirdos! You can never be too careful who you are re-homing a pet to, it is so important to check the new potential owners out. A few weeks later, Lou arrived and she has been here ever since. She is quite a shy lady; however she has settled in extremely well. She is the complete opposite of my Ollie, she is so much quieter and much lazier! She adores this tall stand that we brought her which has a bed on the top of it, she lies in that most of the day, occasionally getting up for a stretch and food. She does however love to play in the evening, she has so many toys now that I think we will have to buy a dedicated box for them all. I also love that she will jump on over and sit on your lap, Ollie did used to do this but not as much, this was of course just the way he was. Lou is definitely more of a lap cat, although she is still quite shy and will jump at any sudden movements. I think it is taking her sometime to fully trust us, perhaps that is down to her age as she is 10 years old and therefore does not have the no fear element that a kitten would have. She is more wary and that is to be expected. Over the last two weeks she has seemed to make real progress, she even snuggled up right to me on Saturday on my chest and fell asleep which she had not done until now. I think Lou stumbled into my life at the ideal time, I miss my Ollie more than you could ever know, however she has helped with the healing process immensely and she is quickly becoming part of our family. I love driving home from work knowing that she will be there. She is a big ball of fluff and I could not imagine not having her in my life now. This will be her first Christmas with us and I am really excited, although she will have no idea what is on I’m sure. 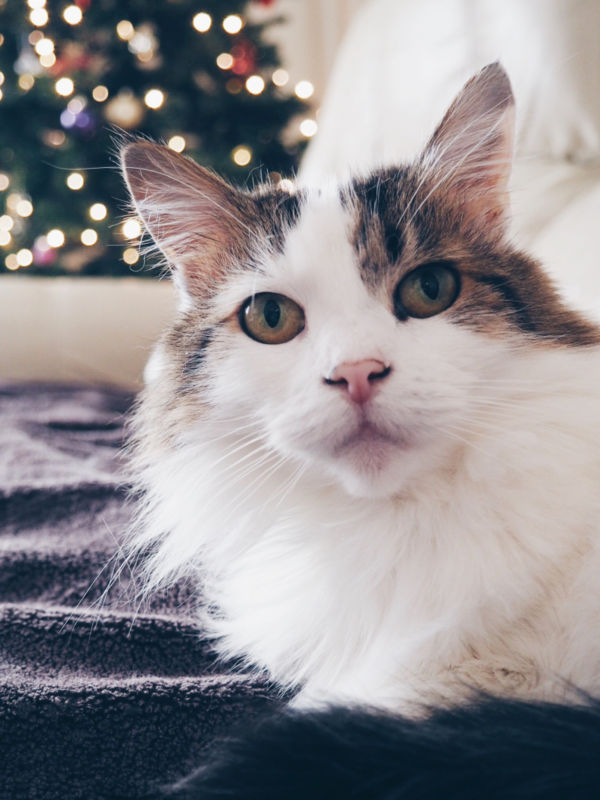 Have you ever re-homed a older cat after losing your own? How did you find it?